Spray Lake Sawmills Open Houses. Wednesday, May 8 in Cochrane, and Thursday May 9 in Blairmore. Spray Lake Sawmills is having open houses on Wednesday, May 8 in Cochrane, and Thursday May 9 in Blairmore. On May 8th and 9th Spray Lake Sawmills will be hosting our annual open houses. May 8th will be located in Cochrane at the Cochrane Curling Club and May 9th will be held in Blairmore at the Blairmore Legion, both will run from 3:00 to 7:00 PM. The purpose of the open houses is to provide an opportunity for interested parties to view our harvest plans. This includes the company’s General Development Plan as well as the area specific Forest Harvest Plans. Spray Lake Sawmills’ Woodlands staff will be available to help answer any questions and hear any comments you may have to offer. Everyone is welcome, even if it is just to meet the Woodlands staff and join us for a cup of coffee. This is a good opportunity to see what the company has in mind for the next while, and to let them know what you think about industrial clear-cut logging in the Castle, Star Creek, Todd Creek, West Bragg Creek, and so on. 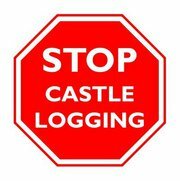 You are currently browsing the Stop Castle Logging blog archives for May, 2013.